Our product range includes a wide range of hydraulic shearing machine. 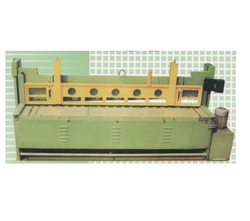 We bring forth a qualitative range of Hydraulic Shearing Machine, that are manufactured using best grade components. Precision engineered using advanced technology, these are acknowledged for their compact design, rugged construction, and easy operations. Known for their optimum productivity and cost effective operation, these are widely demanded in various industries. Moreover, our range is quality tested on various parameters in order to meet the relevant industrial standards. Looking for Hydraulic Shearing Machine ?